Action Wildlife Removal is a nuisance wildlife removal company in Bolton. Our expertise lies in the safe, effective and humane removal of nuisance wildlife from residential and commercial properties. With our skilled and qualified humane animal trapping, residents can rest easy knowing that they have hired the right company. We work together with our customers to understand their needs and priorities, and then come up with solutions that address the issues individually. Our staff has trained professionals in wildlife removal. They understand the need for safety but are respectful of the property owner. 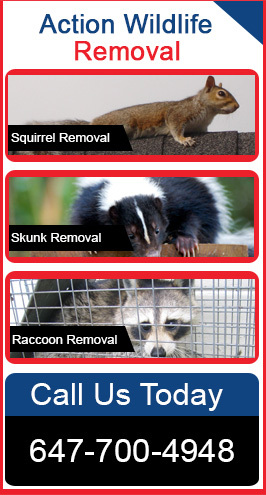 We specialize in the humane removal and relocation of raccoons, skunks and squirrels. We provide professional raccoon removal and control services to the residents of Bolton including raccoon trapping, raccoon exclusion, emergency raccoon removal, and more. Our wildlife control specialists are experienced in removing raccoons from places like attics, inside walls, chimneys, crawlspaces, and other difficult locations. We are a full-service wildlife removal company and also provide services such as attic clean outs, chimney capping, vent screening, etc. If your home or office is being invaded by raccoons, contact us today and ask how we can help you. Skunks are well known nocturnal residents of Bolton. They are usually the size of a house cat and are easily identified by their black body with a white stripe running down their back. These animals have earned their bad reputation through the foul odor of their musk, which they use as a defense weapon. Adult skunks start breeding in late February to March, and give birth to 4 to 6 young through May and June. It is the burrowing and feeding habit of these animals that can cause problems for humans. They may burrow under decks, sheds, porches, and along building foundations. Because of this we recommend our skunk removal as soon as you realize you have a skunk issue. No doubts, squirrels are cute, appealing and entertaining animals with their acrobatic skills. But they can become a nuisance when they infiltrate and set up nests in residential and commercial areas. They are capable of causing significant damage to your property and electrical system should they gain access inside one’s attic. They can gnaw on electrical wires and bring parasites and diseases into your home. If you have a squirrel problem in Bolton, give us a call to schedule an inspection with one of our wildlife control technicians. Critters are bad news. They invade your home or office leaving their droppings and wastes everywhere. They nibble and chew on power lines and cables that provide electricity, internet, phone service, and television services to residential and commercial buildings. Wildlife, especially skunks and raccoons also search through your garbage spreading waste and trash around your yard leaving behind a huge mess for you to clean. And the worst is that they are often infected with dangerous diseases that put you, your family, pets and any possible visitors at risk of becoming ill, potentially leaving you responsible for not only property repair costs, but also medical expenses. Wildlife brings damage and chaos with them, so protect yourself by calling Action Wildlife Removal services. Looking for a price? Contact us to receive a no cost, no obligation free estimate.